Many BJP leaders in Karnataka feel mishandling of the Yeddyurappa and Reddy brothers issue cost them the assembly election. Vicky Nanjappa reports. Reddy and Yeddy were the reasons for Bharatiya Janata Party’s defeat -- this is the general perception at the party’s Malleshwaram office in Bangalore. Even as the BJP began introspecting its dismal defeat in the Karnataka assembly polls, many in the party were extremely disgruntled. Although many BJP leaders were trying to put up a brave face, most leaders acknowledged the fact that their party was decimated in the polls due to bad handling of both the Yeddyurappa and Reddy brothers’ issues. A BJP leader told Rediff.com that they should have handled the situation better when the mining barons-turned-politicians Reddy brothers of Bellary were on a mission to bring Yeddyurappa down. “I think the BJP gave in too much to them and this ought to have been prevented at any cost. The BJP is a cadre based party and ought to have controlled the Reddy brothers,” the leader admitted. “Even in the case of Yeddyurappa, the BJP ought to have adopted a carrot and stick policy instead of antagonising him to such an extent. He has managed to cause a great deal of damage to us in this election. He has made a difference in nearly 60 to 70 constituencies,” he sought to point out. “Our major losses due to infighting have been in the urban areas of the state. 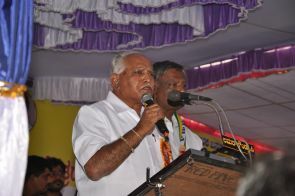 Shimoga and Mangalore were largely lost due to Yeddyurappa,” the BJP leader added. However, R Ashok, one of the few candidates who won on a BJP ticket with ease, was quick to add that the Congress won due to their fighting and not because of themselves. “We are sad, no doubt, but have not lost hope. We are a cadre based party and we know how to pull ourselves out of such situations. We have struggled a lot and will continue to do so,” Ashok also said. He said that the path ahead may be tough, but there were some troublemakers in the party, such as Renukacharya and H Halappa, who have now quit. “This is like a new beginning for us and we will come back strong the next time,” he added. Here's what YOU must know about Karnataka election!